Solibri Model Checker v9.9.3 Released! HELSINKI, Finland, December 18, 2018. Solibri Model Checker v9.9.3 is now available for download. This release focuses on the continuous improvement of the user experience including rule improvements. HELSINKI, February 22, 2018 – ARCHICAD users can now fully benefit from the latest update of Solibri's unique software extension that provides a link between ArchiCAD and Solibri Model Checker (SMC). BCA Academy of the Built Environment is the education and research arm of Singapore’s Building and Construction Authority (BCA). BCA Academy is organizing the INTERNATIONAL BIM COMPETITION 2015 Open to all University (Tertiary Level) Students. Registration Period on 6 APR - 17 MAY 2015. Eindhoven, The Netherlands - December 17, 2014 - KUBUS announces the release of its new ground breaking BCF based issue management system in the cloud: BIMcollab®. It operates across applications; it helps bridging the differences between BIM tools and targets the multidisciplinary cooperation between companies working on construction projects. 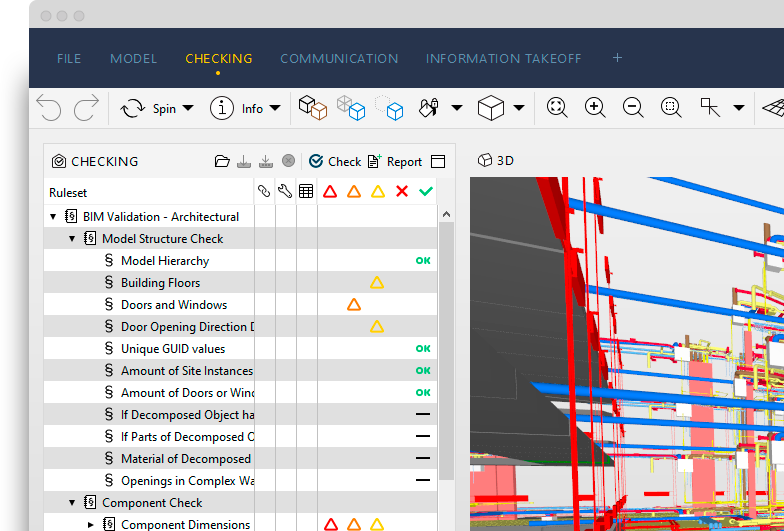 BIMcollab® is designed to manage issues during design and construction phases where BIM is used. Helsinki, December 1, 2014 – SOLIBRI, Solibri Model Checker (SMC) v9.5 is now available. This release delivers several new exciting features and capabilities to the marketplace. V9.5 focuses on improved Quality Assurance and Quality Control (QA/QC), project collaboration and provides support when away from the desk and using SMC. May 5, 2014, Solibri announced the latest software release for Solibri Model Checker (SMC). With version 9.1, Solibri has focused on the core values of continuous improvement and fresh innovation. There are a host of new features for enhanced communication and information sharing, based upon customer needs. This includes updates for markup, local/global coordinate stamps, and the options to add pictorial notes. The Solibri Solution Center (SSC) is a cloud based meeting point to access the latest solutions for Quality Assurance and Quality Control. This customized content will come from Solibri, its partners, 3rd party developers and multiple BIM organizations. Content will be updated frequently and as BIM continues to evolve, there will be a wide range of content to choose from.